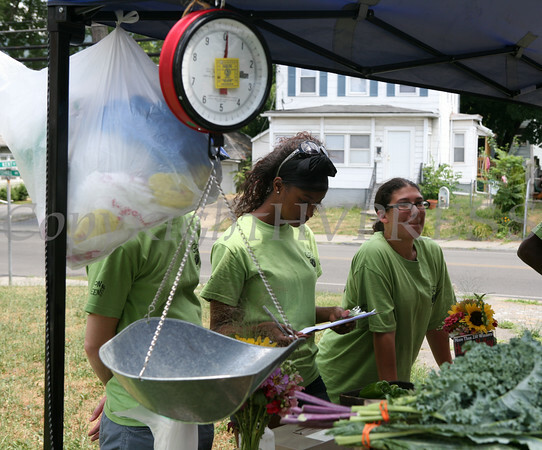 The Green Teen Community Gardening Program was at the old Beacon High School on Friday, July 9, 2010 selling fresh vegetables. They will be there every Friday thru October from 2:30-3:30 p.m.
Green Teen Community Gardening Program members Leslie Hughes and Lisa Galarza arrange some of the many vegetables the group has for sale. The group has a garden at the old Beacon High School and will be set up there every Friday from 2:30-3:30 p.m. thru October. Hudson Valley Press/CHUCK STEWART, JR.